Two randoms bit of Williamsana to report. John True Ridley, ’60 has passed away. Mr. Ridley taught English at Mt. Greylock Regional High School in Williamstown. In 1965, he began working at Houghton Mifflin. In 1991, he was appointed vice president of the school division. Then he became vice president of the school marketing division and corporate vice president of educational strategic development. He retired in 2001. Fun article about architect Parker Croft’s ’72 vision of Time for One World. Bricks and boards are the usual building blocks for Middlebury architect and sculptor Parker Croft, but one of his latest creations features minutes and hours. As the ball dropped at a New Year’s Eve party five years ago, Parker overheard a conversation about how the year starts at different times around the globe. He realized he found that idea absurd. A fun concept. Go here from some background reading. Best part of the article is that, although the whole project has a bit of goo-goo internationalism about it [Not that there is anything wrong with that! — ed], the criticism comes from the left. Most commentary has been positive, he says, but the project is not without controversy. Generally, when the clocks are installed. He heard one complaint that it promoted globalization. In other words, Croft is being a no-good imperialist to travel the globe and impose his vision of time on the innocent local populations. Or (worse? ), by providing a vision of global time, Croft is leading us to recognize our common humanity and, therefore, think more globally and, presumably, act less locally. Or something. There is just no pleasing some people, as we here at EphBlog know all too well. This is about half a mile past the top of the upper loop going counter-clockwise. 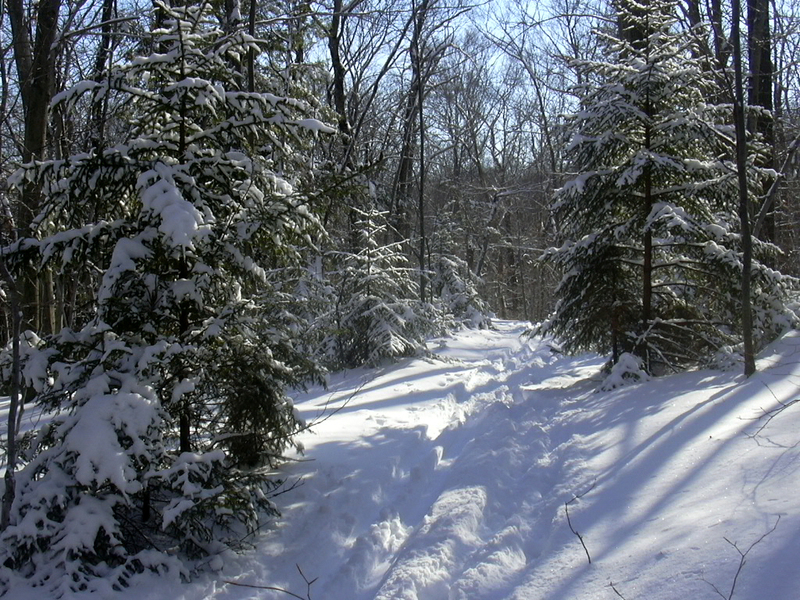 For the whole rest of the 5-mile forest loop, there are tall, mainly deciduous trees on both sides of the trail, but at this one particular spot, there are these beautiful little trees, often (as here) covered in snow. To see this spot, you have to be quite a dedicated runner/hiker/skier, since it is about four miles, and quite a lot of vertical elevation, from the college. Blake Robison ’88 has been chosen to lead Round House Theatre in Washington DC. Lee Altman ’93 provides this discussion of “Tenure Issues in Higher Education“. Schapiro and McPherson offer a solid examination of tenure from an institutional efficiency perspective, but I do not see explicit mention of tenure as the great non-monetary equalizer of postgraduate life. Doctors, lawyers, M.B.As can point at their paychecks and proudly display their degrees. By contrast, professors can point to their job security and “academic freedom” as the rewards for their years of preparation. For institutional efficiency, tenure’s greatest value may be in equalizing perceived professional status with other careers requiring advanced degrees. According to the government-sponsored national 2002 Survey of Earned Doctorates, the median years spent in graduate school is 9.0 for the humanities, and the median age for earning a doctorate is 34.7. Prior to finding a tenure-track slot, it is common for candidates to spend years in postdoctoral fellowships, adjunct or non-tenure positions. While it is harder to find statistics on the median age of professors receiving tenure, 40+ years seems a fair estimate. Where does the real value of tenure lie? Does it primarily serve the needs of institutional efficiency? Is tenure the paramount motivation for enduring many years of arduous doctoral and post-doctoral preparation? Are liberal arts colleges more or less friendly to tenure systems, with their focus on quality of teaching? And can colleges like Williams maintain their quality of education, if tenure declines nationally as an institution? … so let’s hear about them! If you are currently engaged in an interesting, unique, or otherwise great Winter Study class/project (which we hope they all are!) everyone at EphBlog would love to read about them. You can write a daily or weekly update of what you are doing, or just a one-time synopsis of something interesting that’s happened; anything you want to do is fine. If you are already an author, blog away! Otherwise e-mail Eric Smith ’99 and ask him to set you up as an author, or just send your post via e-mail to me and I will post it for you. The Williams cross country team has many traditions, and one is the freshman talent show, which is sort of our politically correct version of initiation. We have the freshmen perform onstage for the amusement of the upperclassmen. As my “talent,” I wrote a poem called “The Night Before NESCACs,” NESCAC being our athletic conference. That was basically a parody of “A Visit From St. Nicholas,” which we all know as “Twas The Night Before Christmas.” I remember little bits here and there: “Twas the night before NESCAC, and all throughout the Northeast/ eleven cross country teams sat down to feast/ They ingested something something and spaghetti/ To make sure that their carbo reserves would be ready.” Eventually, I get them to bed, and they wake up the next morning and there’s a section where I’m trying to mimic the calling out of various reindeer by name. I used everyone’s nickname: “On Strapper, On Doggie, On So and So.” But just before that I said “A little man called to them as they approached/I knew in a moment it must be their coach,” which was funny, because our coach, Pete Farwell, is a little man, sort of the opposite of Santa Claus, 5’6″ and 120 pounds. Crowther has moved on to writing songs about muscle physiology and metabolism for his students at the University of Washington, which you can listen to here. Political Science Professor Marc Lynch has a mostly optimistic article on Arab media that is worth a read. For Day 1 of our experiment in creating a Cross Generational Community of Learning, our assigned reading is “The Blurring Line” by Michael S. McPherson and Morton Owen Schapiro. What is the role (are the roles?) of universities in the United States? I would argue that higher education is institutional, in the same sense that the military or the Supreme Court is institutional. It is straight-forward to describe what universities do, but the institutional aspect relates to what “the university” means. The military is the institutional form of bravery and honor; the Supreme Court is the institutional form of fairness and wisdom (quite a separate trait than intelligence); the university may be the institutional form of progress, discovery, honesty, truth, opportunity, etc. What does the university mean to American society? What does Williams or Harvard mean to American society and to us? If universities establish society’s desire for the honest pursuit of knowledge, what does it mean when universities twist financial aid decisions? Surely universities are entitled to tailor policies, but shouldn’t these policies be explicit? And is the pursuit of knowledge antithetical to the mission of universities as the great equalizers in our very unequal society? How can a leading college like Williams be both a place that educates the “most talented” (I leave that to you to decide how talent is measured) and enables those from otherwise disadvantaged backgrounds to attain for themselves and for their children the advantages associated with a degree from Williams? Can it? Should it? Should universities be meritocracies? How is financial aid a tool to accomplish the goals of the university and if you had to decide between funding merit or funding need what would you choose? Good questions all. Many thanks to Richard for taking the time to read the article and for providing this start to our discussion. Others are encouraged to answer Richard’s questions in the comments and/or to provide their own thoughts on the article. When I made a similar post on a WSO blog, Jono Dowse ’06 informed me that what I had seen was a sun dog, which occurs when the sun reflects off of ice crystals that are exactly 22° to the left or right of the sun, and at the same elevation. For me, this sun dog lasted only seconds; the wind soon blew the cloud apart, so it was a very ephemeral rainbow. EphBlog will be running an experiment in creating a cross generational community of learning during Winter Study. See the syllabus for details. All readers are welcome to participate. Day 1 is here. Day 2 is here. Day 3 is here. Day 4 is here. Day 5 is here. Special thanks to Richard Dunn ’02, Lee Altman ’93, Diana Davis ’07, Kevin Koernig ’05 and Lowell Jacobson ’03 for serving as discussants. I just spent sometime going over my posts here, and am actually more pleased with what I found than I expected to be. Mike is too modest to mention his funniest post, preserved on EphBlog for all eternity. Belated congrats to Susan and, in particular, to my classmate Nick! Not directly relevant to Williams, but I think this article http://www.nytimes.com/2005/01/09/magazine/09FRATS.html?oref=loginin the NYTimes Magazine provides an interesting perspective on the drinking culture on college campuses. It sounds like what is happening at frats is very similar to what has happened at Williams: an administration crack-down on social keg-party style consumption, which creates a very different campus culture, in some ways for the better (the freshman girls t-shirt is one I hope would never make an appearance on the Williams campus), but in others, to the detriment of campus social life. In light of our long debate about drinking on campus, it’s an interesting read. One thing the article does not do, however, is make me sorry I missed out on the frat experience — Captain Crunch and Beer is a combo I’ll happily forsake. Following the draft posted a few weeks ago, I have updated the “About EphBlog” section of the site. This is still somewhat of a draft. I’ll be adding items over the next week or so. As always, comments and suggestions are welcome. I would be especially interested to hear about other links that should be included. I have tried to be clearer about my personal opinion about the manner in which EphBlog tries to fill several goals, most importantly as both a source of Eph news and a forum for Eph discussion. Readers/commenters/authors who think that EphBlog should be something different, should speak up now and make a positive case for what EphBlog should be. This update is a part of the general clean up of the site. Special thanks to Eric Smith ’99, the Eph who really makes EphBlog possible. Bill Bennett ’65 has thoughts on “The Democratic Dialectic, the Democratic Problem.” Unless you already agree with him, you are unlikely to be convinced by the argument. Does Affirmative Action Hurt Black Students? Many will remember that in early 2003, Williams joined 27 other private, highly selective residential colleges in filing an amicus brief with the Supreme Court supporting the University of Michigan’s position in two highly publicized affirmative action cases (Gratz v. Bollinger and Grutter v. Bollinger, which deal with the University’s affirmative action admissions policies in the undergraduate and law school, respectively). David put in a plea for some current photos, so I thought today’s snowstorm was the perfect opportunity. Todd Gamblin ’02 complains that getting a copy of your transcript distributed is a bother. I guess this depends on the school, but at Williams you have to fax in a signed form saying you release your grades to some institution. There has to be a better, faster way to do this. I mean, schools could scan in your transcript and make it available on a secure page in PDF format. I know I submitted a preliminary version like that to the NSF last year. I figure someone could make at least a little bit of money by starting securetranscripts.com, and relieving me of all this extra crap I have to do to get my information sent out places. His point is well-taken, but for me the more interesting question concerns what is public and what is private about our time at Williams. I can’t, I guess, call up the registrar and get a copy of Todd’s transcript without his permission. But I think that I can call up and determine, without his permission, whether or not he did in fact graduate in 2002. I wonder, also, what other information — like major(s) and/or latin honors — is “public” in this sense. To the extent that graduation data is public, then the College ought to make it very public. It should provide a web page, for each year, of every graduate and her major(s). Kenyan environmentalist Wangari Maathai was awarded the Nobel Peace Prize on October 8 for her efforts to promote ecologically viable social, economic and cultural change. She received an honorary degree from Williams in 1990. An Eph hoops mention on SI.com, number ten on the 10 spot. McEntegart notes that he is an Eph alum with an interesting Dave Paulson connection. I think Williams probably gets about as many mentions in SI and on SI.com as the rest of Division III combined. EphBlog’s experiment in creating a cross-generational community of learning (CGCL) starts next week. Here is the syllabus. This project, like EphBlog itself, is goofy beyond words, but there is no stopping it now. Like any good professor, I made sure to include one of my own articles . . .
Todd Gamblin ’02 has interesting thoughts on information overload in the modern world. All of this leads to a feeling of distraction and inability to concentrate, because you can’t think about what you’re doing at the moment when you know there could be some interesting bit of news popping up somewhere, or that you might have email, or that someone might have updated their blog. I don’t really know how I get anything done. As far as I know, Todd doesn’t even have a wife, much less any children. Distractions, indeed. The draft of Dan Drezner’s ’90 latest book. The main advantage of the Drezner work is that it is a large, cohesive body of cutting edge scholarly work. That’s also its main disadvantage since the cost of entry into the discussion will be somewhat high. Right now, I am leaning toward option 2, but looking for feedback. UPDATE: Other possible articles include this and that. Around the world people are coming together in one way or another to try to help out with the Tsunami. Amazon and Apple both made the front pages of their sites dedicated to ways to contribute towards the related relief efforts and agencies coordinating them. I received an e-mail today from Zahie El Kouri (sorry, the alumni search page yielded no class info Class Secretary for ’93) today which describes an Eph effort to raise money for the disaster. The e-mail was a forward from someone named “Pete” Pete Kirkwood ’93. Pete and Liz Rosan Kirkwood ’94 are environmental lawyers who moved to Thailand a few years ago. I am a Williams alum, class of ’93 and for the last two years my wife (Liz Rosan Kirkwood, ’94) and I have lived and worked in Thailand- she as a consultant in environmental policy in Bangkok and me as a property developer in the village of Kamala, Phuket (one of the areas in Thailand hardest hit by the recent tsunami). We chanced to have been in the US for the holidays when the waves hit, and by some miracle our home and my project (http://www.thecoolwater.com/) were both untouched by the destruction. Many of our neighbors, however, were not so lucky (see,for example: http://news.bbc.co.uk/1/hi/world/south_asia/4127341.stm). As you will have seen on the news, many lost their homes, many lost all of their possessions, and many lost their loved ones or even their lives. Upon hearing the news of the tragedy, Liz and I, like most others, were at first paralyzed by the enormity of it all. Then we thought of rushing back to join in the relief efforts. But then, in the face of a huge outpouring of support and concern from friends, colleagues, family and even complete strangers, we realized that we have a unique opportunity to turn that support and concern into concrete assistance for our devastated neighbors. So we began an online fundraising campaign. Since we began that campaign about four days ago, we have raised over $15,000. When I return to Phuket on Thursday, I will immediately begin using these funds to offer hands-on aid to the injured and bereaved. But I’d like to do more than $15,000 enables me to do, so it occurred to me to give Williams alums the chance, if they are so inclined, to take part in this campaign, and to help maximize the impact of my efforts. On Phuket (and nearby areas of the mainland), I can mobilize vehicles for transporting supplies and the injured, and I have access to houses for sheltering the displaced. I speak Thai, I know the island, I understand Thai culture, and I will personally see to it that all funds donated to the Shawnee Institute have maximum real-world impact. The large aid organizations are doing excellent work in the affected areas, and we look forward to working hand-in-hand with them, but our efforts will be special, personal, and particularly effective: we are residents of the area, we are accustomed to getting things done Phuket-style, and we have no organizational overhead- every dollar will go directly where it’s most needed. Because I speak Thai, English, Spanish, and French, I know that I can provide invaluable help both to local families and to stranded and bereaved tourists. In any case, please know that we are safe and that the people of Thailand are showing their indomitable spirit- pulling together, focusing on the future, and working hard to put their lives back together. Despite the destruction, Thailand is still a warm and beautiful place, and the economy needs your dollars So don’t cancel next year’s Siamese vacation- and if you weren’t planning one, then I suggest you start! Despite the sensational news reports you have probably seen, many hotels and resorts have come through the destruction practically unscathed. It is by and large Thailand’s working people- fishermen and villagers living in humble houses- that have been harmed and displaced, and it is these people that the Shawnee Institute is focused on helping. I donated to the American Red Cross International Relief Fund a few days ago via Amazon’s One-Click system, mainly due to its convenience. Incidentally, any discussion of American tax dollars already going towards the efforts should probably be held off for another time/place since that could likely lead to more of an argument and less constructive efforts. EphBlog is powered by WordPress and delivered to you in 1.742 seconds using 27 queries..